Jakarta, June 1st 2015 - Following the success of its newest brand, Archipelago International's Harper portfolio will soon be increasing by five new properties across Indonesia in the coming two years. Currently, the Harper brand covers two hotels in two of Indonesia's most prominent destinations: Bali and Yogyakarta. But by the end of 2017, the Harper brand will have five new names under its belt: Harper M.T Haryono - Jakarta; Harper Purwakarta - West Java; Harper Pasteur - Bandung; Harper Perintis - Makassar; and Harper Puncak Gate - West Java. 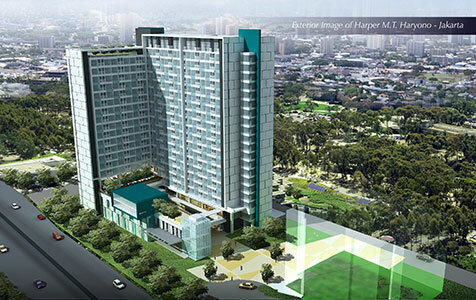 Harper M.T Haryono - Jakarta is set to open in the 3rd quarter of 2015. The hotel is located on Jl. MT. Haryono Kav in Cawang, Jakarta and will feature 131 rooms, five meeting rooms, Harper's signature Rustik Coffee Shop, a swimming pool, gym and a spa. The hotel provides convenient access to Jakarta's CBD, the Bekasi industrial area, and also to the two main airports; Halim Perdanakusuma Airport just 7 minutes away, and Soekarno Hatta International Airport just 40 minutes away. Also opening in the 3rd quarter of 2015 is Harper Purwakarta - West Java. Located on Jl. Bungursari in Purwakarta-Jawa Barat, Harper Purwakarta will be a modern hotel infused with a rustic charm and a warm, comfortable and almost residential feel. The hotel is a short stroll from the Cikampek / Dawuan / Sadang toll road and is surrounded by cultural and natural tourism spots, local eateries and the Pupuk Kujang Cikampek Golf Course. Harper Purwakarta is only one hour from Bandung and one and a half hours from Jakarta, making it an ideal hotel for both short stay vacations and productive business trips. The hotel offers 130 guest rooms and suites, nine state-of-the-art meeting rooms and a ballroom that can accommodate up to 700 delegates. A wide range of facilities includes the signature Rustik Coffee Shop, an outdoor swimming pool with a kid's pool and a convenient poolside restaurant, as well as 24-hour reception staff and room service, excellent complimentary high-speed WiFi and the highest service standards in the region. Harper Pasteur - Bandung shall then open shortly after in the 4th quarter of 2015. Sitting in an ideal location on Jl. Dr. Djunjunan at the gateway to Bandung, Harper Pasteur offers easy access to the Paris Van Java Mall and the Husein Sastranegara Airport. 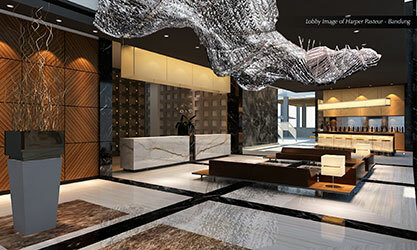 The hotel will feature 256 rooms, 10 meeting rooms, Harper's Rustik Coffee Shop & Lounge as well as a swimming pool. Crossing the archipelago to Sulawesi, Harper Perintis - Makassar also plans to open in the 4th quarter of 2015. The hotel will feature 159 rooms, a ballroom, four meeting rooms, the signature Harper Rustik Coffee Shop & Lounge and a swimming pool. The hotel is located on Jl. Perintis Kemerdekaan only 30 minutes from Makassar's city center and just 15 minutes from the international Sultan Hasanuddin Airport. Guests at the hotel will also enjoy close proximity to the growing tourist attractions in the area, such as Makassar's shopping malls and restaurants, the city's theme park and even the white sand beaches of Samalona Island and Kodingareng Keke, famous for their idyllic swimming, sunbathing, snorkelling and diving spots. 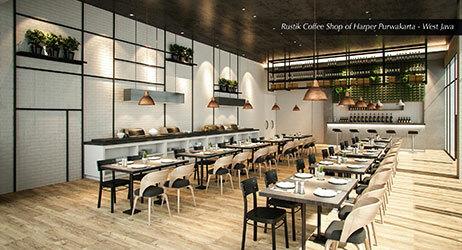 Opening shortly after, Harper Puncak Gate - West Java on Jl. Raya Pertanian, Ciawi Bogor, will feature 301 rooms, a ballroom, nine meeting rooms and the signature Rustic Coffee Shop & Lounge, as well as a spa, gym and swimming pool. Puncak is a popular weekend getaway for Jakartans and many tourists alike, most of whom are visiting for a taste of the fresh mountain air and the numerous natural attractions, including the Bogor and Cibodas Botanical Gardens; the Gede Pangrango National Park; the Plantations and the Safari Park. Archipelago International has also just signed up to open Harper Solo - Central Java, scheduled to open in the 1st quarter of 2017. The hotel will feature 250 rooms, several meeting rooms and a swimming pool. The hotel will be located on Jl. Bridgen Katamso in Surakarta (Solo) Central Java, close to the acclaimed palace of Susuhunan Pakubuwono, Keraton Surakarta, and also the Javanese court of Mangkunegaran. Pasar Gede market is also often visited by tourists, mostly for its unique architecture and renown as the biggest traditional market in the Solo area. "Indonesia has seen extraordinary economic growth over the past four to five years, and the hotel industry has predominantly been driven by the local market. The high demand for accommodation facilities is bolstered primarily by Indonesia's position as one of Asia's most popular tourist destinations, receiving 9.44 million foreign visitors in 2014, resulting from growth of 7.19% compared to the previous year. According to the Central Bureau of Statistics, much of this growth has arisen from catering to the middle-segment of the market, namely the 2, 3 and 4 star hotels. Nowadays in our increasingly anxious world, people want comfort and functionality, and it's no secret today's guests want to be reminded of home. That's why Harper's modern-rustic design concept uses warm, rich colors to offer comfort in each room. Harper Hotels convey a residential feel and a balanced functionality, offering unobtrusive service and never ending innovation - hotels for the astute traveler who values individualism and character. Our expansion in Indonesia is certainly one of our strategies, but we have always focused on quality rather than quantity." Said John Flood, President & CEO â€“ Archipelago International. Seen in the picture - Exterior of Harper M.T Haryono - Jakarta. Seen in the picture - Rustik Bar & Bistro of Harper Purwakarta - West Java. Seen in the image - Lobby Lounge of Harper Pasteur - Bandung.